My dishwashing was interrupted by wild desert pigs sneaking around the back of my trailer yesterday. I was rinsing off my plate with the hose at the dish station, marveling at the silence out here. 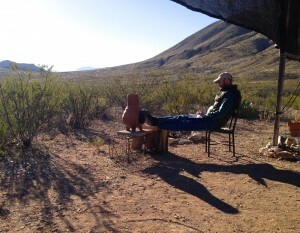 I still can’t get over how quiet it can be here in the Chihuahuan Desert of southwest Texas. Where I’m from, the Great Northern Plains, the open spaces are never completely quiet be it the wind, birdsong, or tree branches rustling. But the desert can be eerily still, and completely silent. So silent that my ears ring, like they are straining to hear something. So when I heard a soft thumping against the tin skirting behind the trailer, my ears locked in. I turned off the hose. Silence. Then it started again. Thump. Thumpthump. I set down the hose and walked around the back of the trailer. Five full-sized javelinas looked up, snorted, and dashed down the hillside. All I saw was their hairy backsides disappearing into the brush. They hid a few moments, grunting their annoyance, then trotted down into the wash and up the rocky hillside of Christmas Mountain, sliding easily through the spiny prickly pear cactus, yucca and creosote bushes that slow my own movements to a careful crawl. It’s odd to see a sleek and nimble pig (a collared peccary, technically) in its natural environment rather than a cartoon, or a livestock pen awaiting slaughter. The javelina is native to the Southwest U.S. and Mexico, perfectly evolved for the harsh desert environment here. Tough, stocky, low to the ground and quick, like a hairy little eighty-pound running back with a snout and delicate hooves. I wish I’d had my camera at hand. But I’ll get another photo op, as I’m down here for four weeks. What’s a nice Minnesota boy doing in the desert a few miles from Mexico? An experiment. The inquiry? What would happen if I took a whole month away from my normal environment, work and routine, traveled alone to one of the most heart-opening yet unexplored places I know, and with no plan, no conferences, no relatives, friends or agenda just stayed alert and let things unfold? And recorded the experience here, in a series of short photo/blog essays? I have no idea what will happen. But I know something will happen. When I’ve given Spirit a little room to move in my life, unforgettable things arise. So, here I am. About a half hour north of the Rio Grande in southern Brewster County, near Terlingua Texas, halfway up the side of Christmas Mountain. 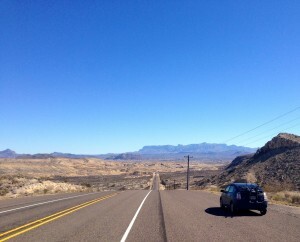 I’m nestled between Big Bend National Park on the east, and Big Bend State Park on the west. I’m renting an old I trailer I found on AirB&B . The owner Lori is a durable middle-aged woman with a smoky laugh, living in her own trailer a thousand yards to the north, barely visible through the candelilla and creosotebush between us. She and her dog Sidney welcomed me the night I arrived, showed me around the trailer she raised her young boy in years ago. “Don’t worry about the rattlesnakes,” she said. “They’re all hibernating. Until it gets into the 60’s or 70’s.” Then she said, “Enjoy!” and walked back into the darkness with her flashlight. I’ve got my mountain bike, laptop, six gallons of drinkable water, four weeks of beans, rice and tortillas, and about a quarter million acres of largely uninhabited high desert, mountains and borderlands to explore. It’s the Jeff Nixa version of Eat, Pray, Love, but I’d call it, Hike, Bike, Ponder. And actually, I do have an agenda, finishing up a book I’m working on (A Modern Shaman’s Field Manual, close to release, at which time you will be excessively notified), start another book (about Jesus the Shaman), and explore the crap out of this place. So let’s get to your questions. No, I’m not having marital problems. Regina gave me her blessing for this little odyssey and she’s even coming down over the Valentine’s Day weekend. (She’s made her own 3- and 4-week solo trips to Peru in recent years for Spanish training and volunteer work, so, hey.) Second, this voyage didn’t happen overnight: it was a year in the planning, ever since I came down here for wilderness first aid training last January. I didn’t have time to explore much then, so I vowed to return. Third, being self-employed (which didn’t happen overnight either) I do get to set my own schedule, and I’m blessed with clients who understand my inclinations for soul journeys. Fourth, my daughters are now both away, in college, which has its advantages. The trip has had its difficulties. My trusty Prius with 160k miles was acting up on the way out, causing delays and $$. But, I’ve found that stepping forward in my life will often trigger a whole squadron of resistant forces entrusted with testing my resolve. Do you really want to do this? they demand. How badly? Bad enough, you thugs. Get a life. What kind of life does your heart want to be living, really? While you’re pondering that, I’m heading out on the mountain bike to explore. 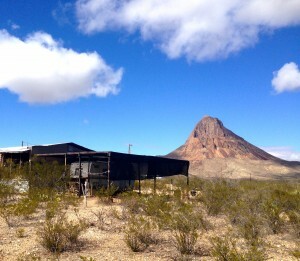 Here’s a couple links to the area: Big Bend National Park, and Terlingua, Texas. There’s just untold ways I can get into serious joy and trouble right outside my trailer door. And it’s warming up today: supposed to be in the 70’s. 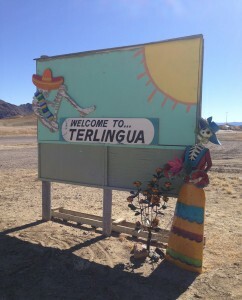 Posted on January 29, 2016 January 31, 2016 Categories Terlingua Desert LogTags beginners, Big Bend National Park, Big Bend State Park, change, Chihuahuan Desert, experience, god, growth, guide, healing, heart, illustrated, journey, love, meditation, mindfulness, mountain bike, mysticism, nature, peace, personal transformation, prayer, secret, shaman, Shamanism, simple, solitude, southwest texas, spiritual, Terlingua, travel, year1 Comment on Terlingua Desert Log: Entry #1. Javelina raid.